David Zambito provides us with an excellent example of a vignette. Small build, but packed with techniques that make a large difference. In this scene, a man is grilling his dinner (an activity I'm sure some of us wish we could be doing right now). 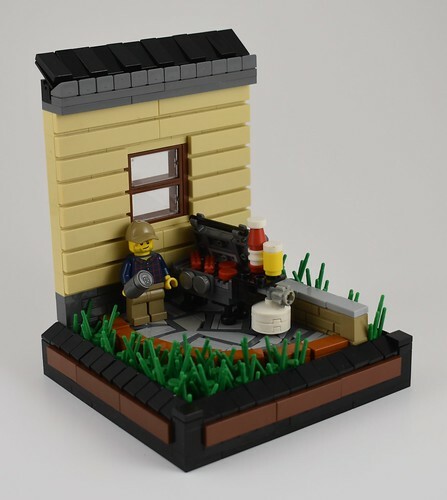 What drew me to this little build is that grill, which is an excellent design (see separate picture below). So simple, but so effective, and one of the best I've seen. The builder also didn't settle for a simple tile patio, instead he chose to use slopes and tiles to create some great stonework, a rather popular technique. It's the little things that can turn a small build into one that leaves a big impression!